Presented by: Accounting Virtual Solutions, LLC A private and secure online service that makes our services more convenient for you. 1 Presented by: Accounting Virtual Solutions, LLC A private and secure online service that makes our services more convenient for you. 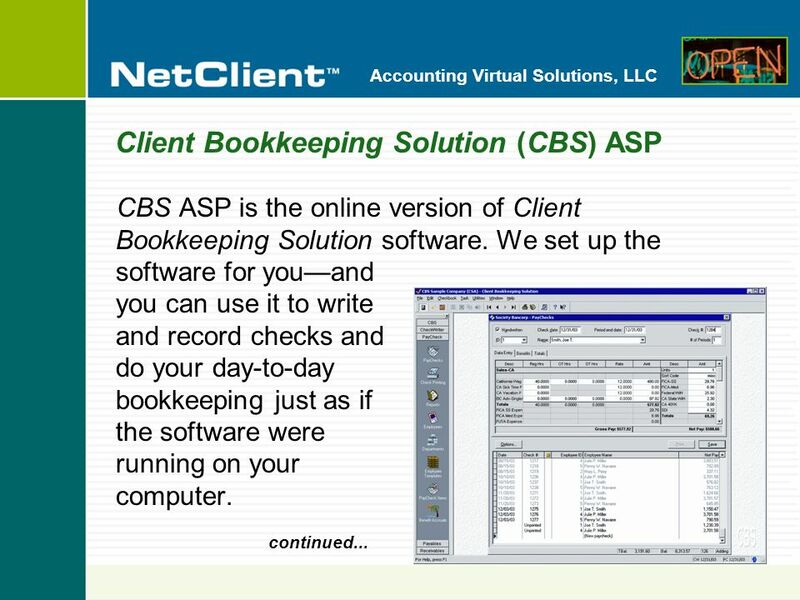 2 Accounting Virtual Solutions, LLC Youre busy. Between running your business and running your personal life, it may not always be convenient to contact us. Thats why we offer NetClient. 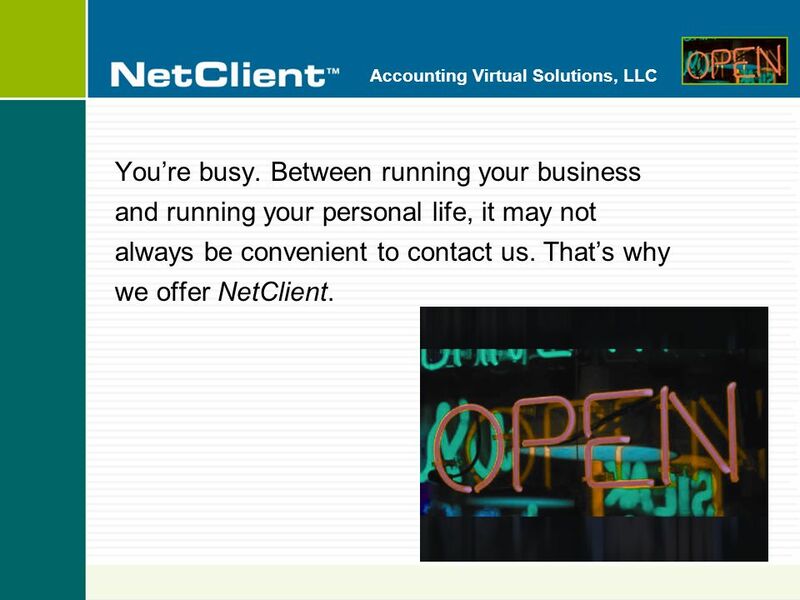 3 Accounting Virtual Solutions, LLC With NetClient you can get accounting and financial information and services via our websiteany time, from anywhere. 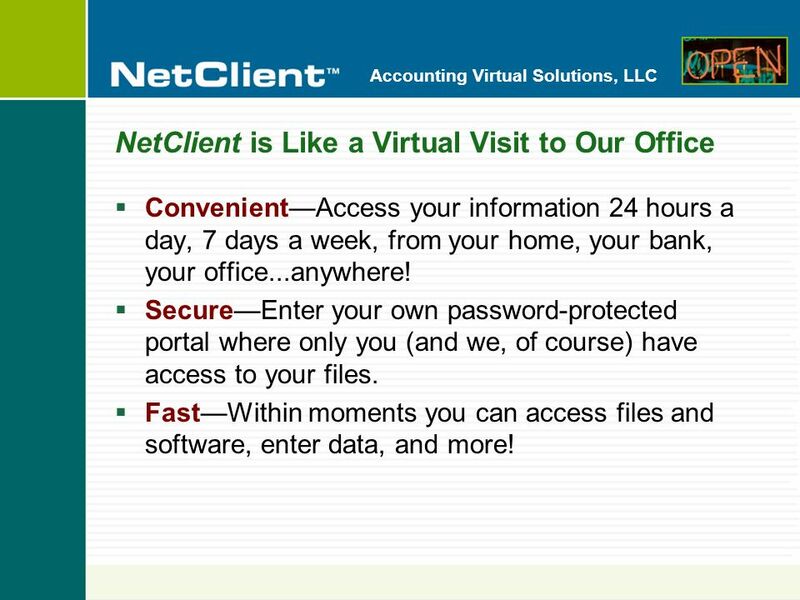 5 Accounting Virtual Solutions, LLC NetClient is Like a Virtual Visit to Our Office ConvenientAccess your information 24 hours a day, 7 days a week, from your home, your bank, your office...anywhere! SecureEnter your own password-protected portal where only you (and we, of course) have access to your files. FastWithin moments you can access files and software, enter data, and more! 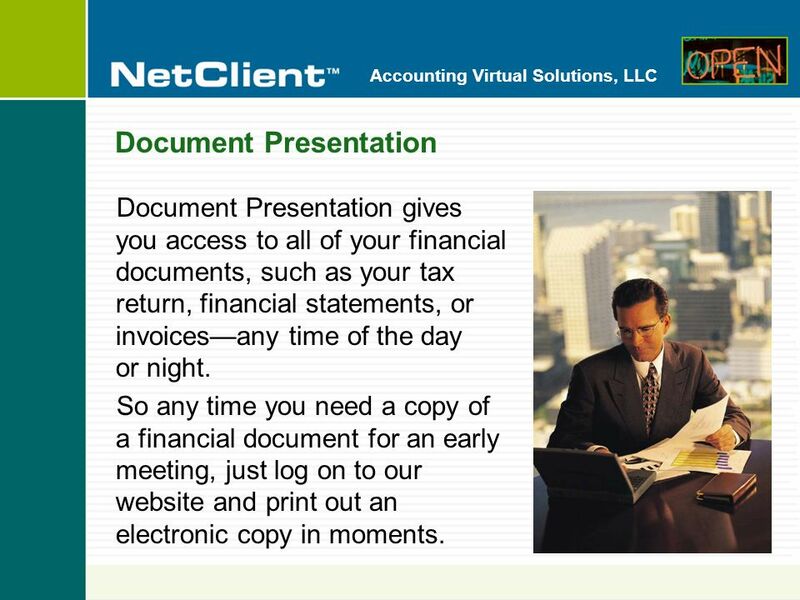 8 Accounting Virtual Solutions, LLC Document Presentation Document Presentation gives you access to all of your financial documents, such as your tax return, financial statements, or invoicesany time of the day or night. So any time you need a copy of a financial document for an early meeting, just log on to our website and print out an electronic copy in moments. 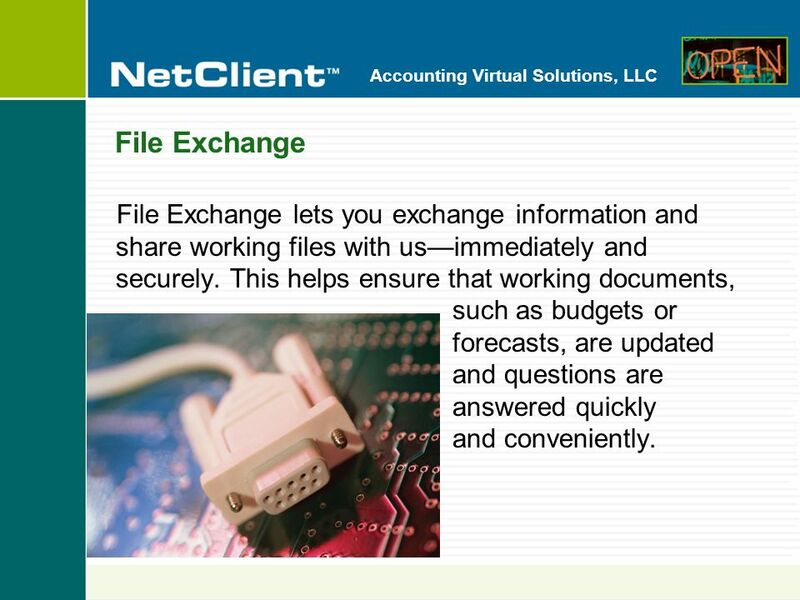 9 Accounting Virtual Solutions, LLC File Exchange File Exchange lets you exchange information and share working files with usimmediately and securely. This helps ensure that working documents, such as budgets or forecasts, are updated and questions are answered quickly and conveniently. 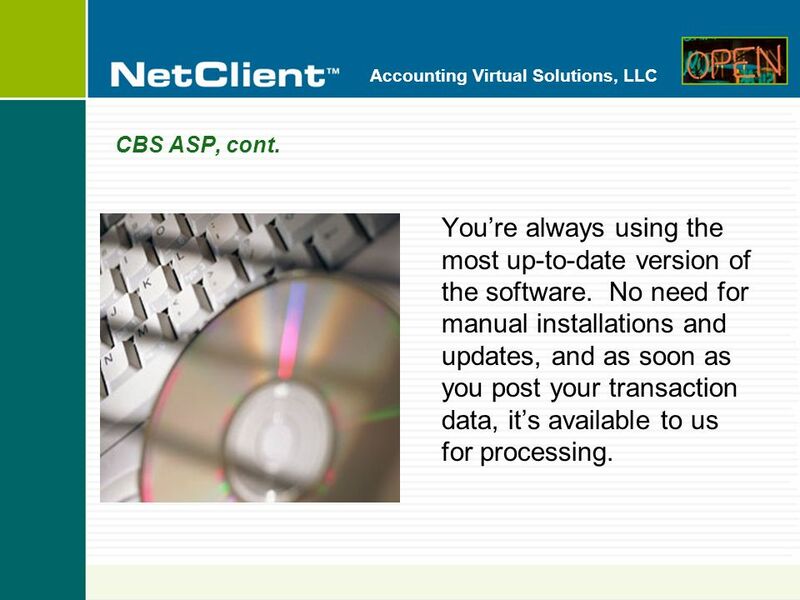 11 Accounting Virtual Solutions, LLC CBS ASP, cont. Youre always using the most up-to-date version of the software. No need for manual installations and updates, and as soon as you post your transaction data, its available to us for processing. 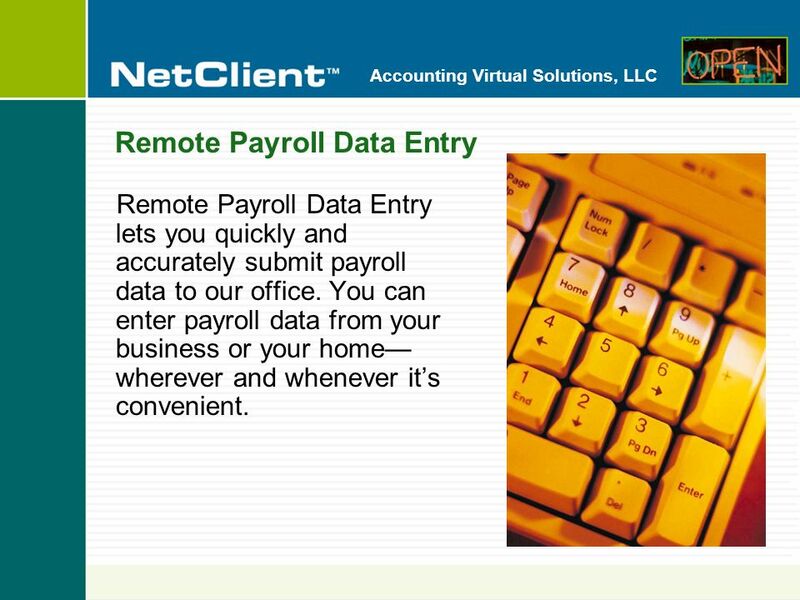 12 Accounting Virtual Solutions, LLC Remote Payroll Data Entry Remote Payroll Data Entry lets you quickly and accurately submit payroll data to our office. You can enter payroll data from your business or your home wherever and whenever its convenient. 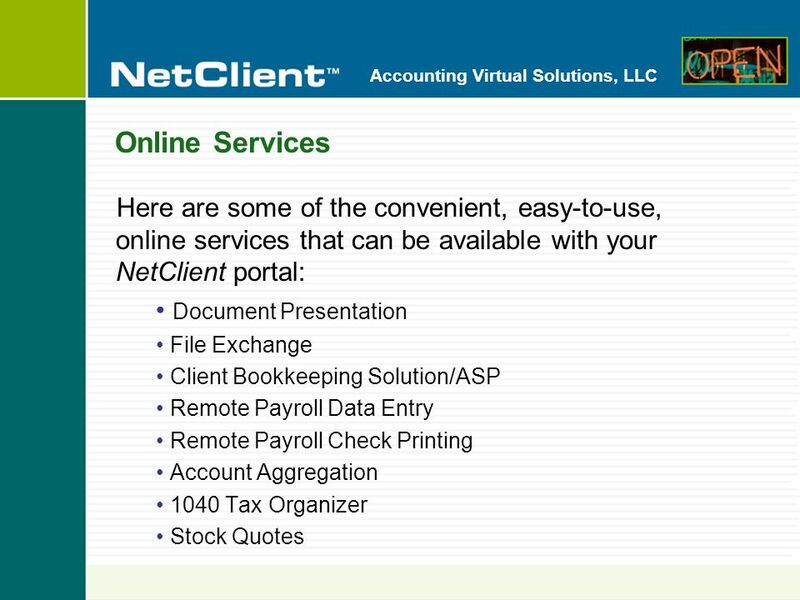 13 Accounting Virtual Solutions, LLC Remote Payroll Check Printing After we calculate your payroll amounts, we can even make your payroll checks available electronically, and you can print them in your office. 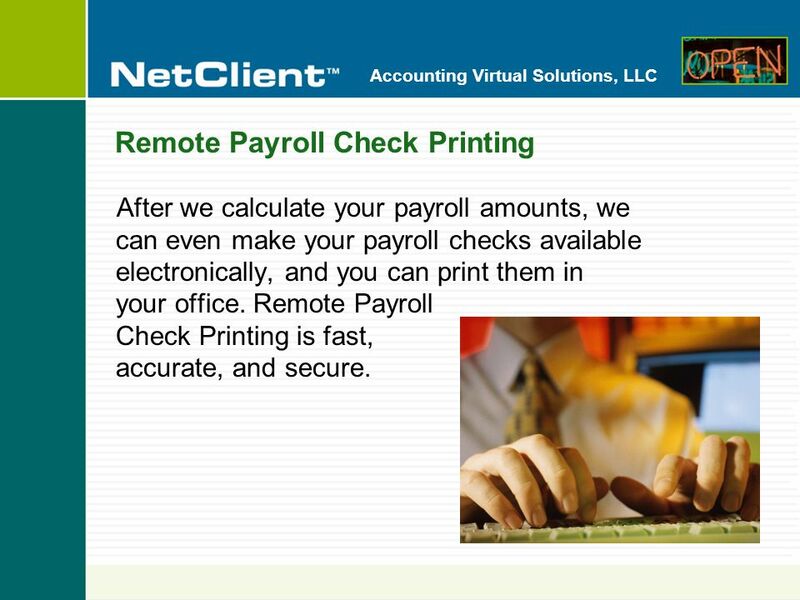 Remote Payroll Check Printing is fast, accurate, and secure. 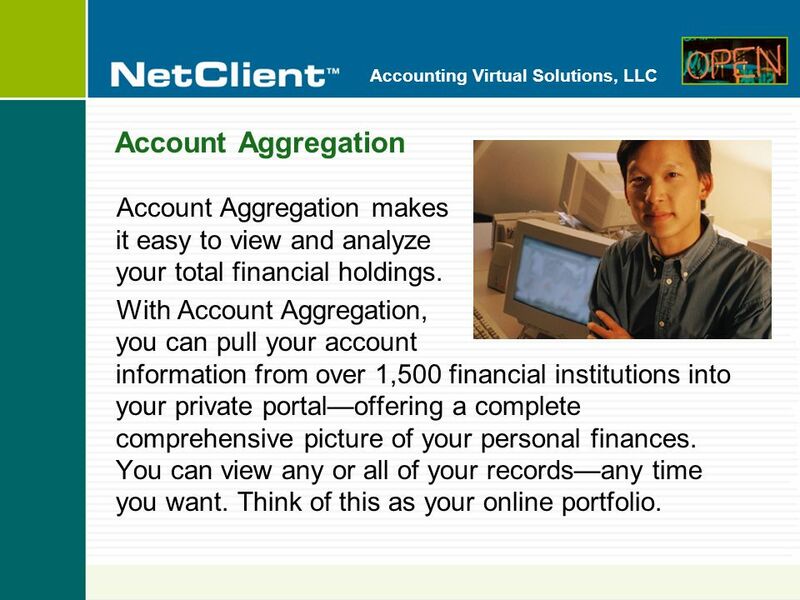 14 Accounting Virtual Solutions, LLC Account Aggregation Account Aggregation makes it easy to view and analyze your total financial holdings. With Account Aggregation, you can pull your account information from over 1,500 financial institutions into your private portaloffering a complete comprehensive picture of your personal finances. You can view any or all of your recordsany time you want. Think of this as your online portfolio. 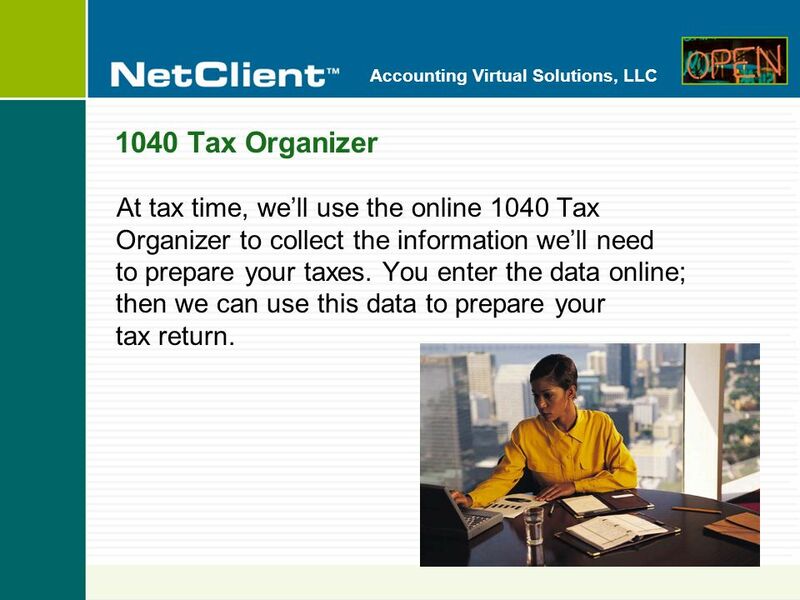 15 Accounting Virtual Solutions, LLC 1040 Tax Organizer At tax time, well use the online 1040 Tax Organizer to collect the information well need to prepare your taxes. You enter the data online; then we can use this data to prepare your tax return. 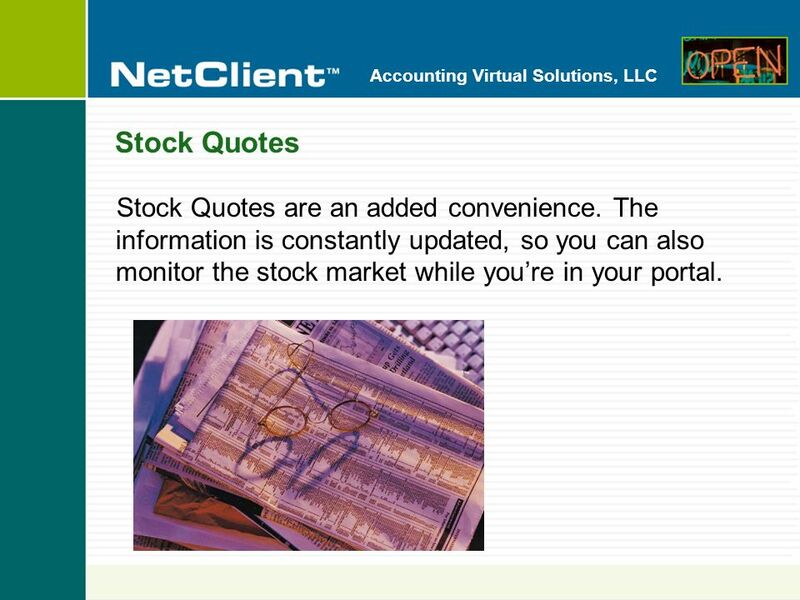 16 Accounting Virtual Solutions, LLC Stock Quotes Stock Quotes are an added convenience. The information is constantly updated, so you can also monitor the stock market while youre in your portal. 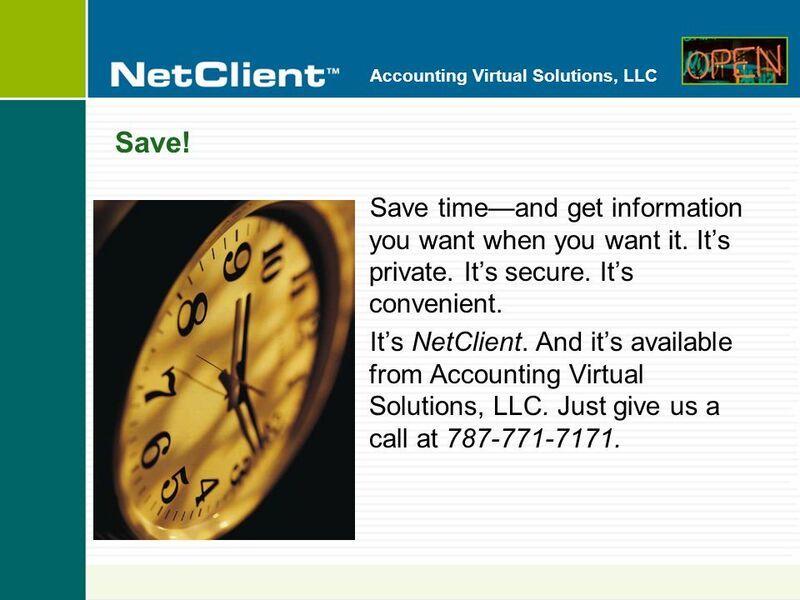 17 Accounting Virtual Solutions, LLC Save! Save timeand get information you want when you want it. Its private. Its secure. Its convenient. 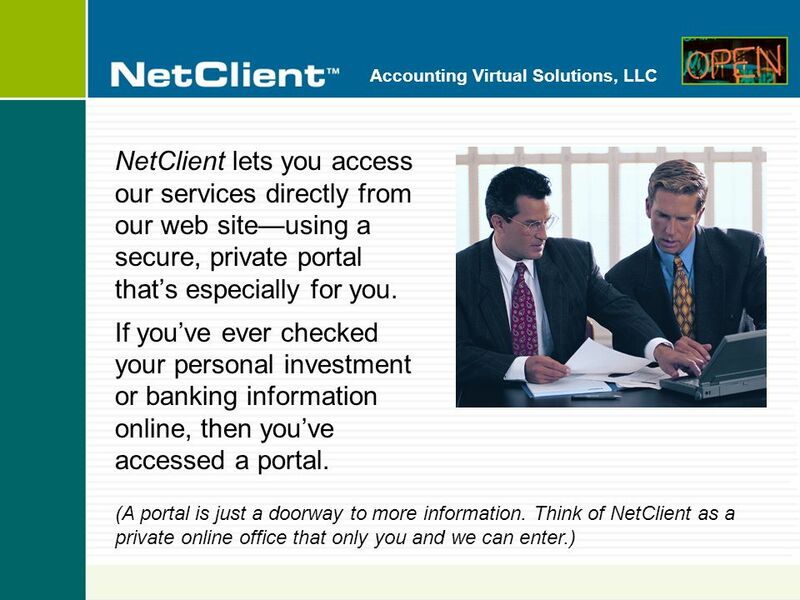 Its NetClient. 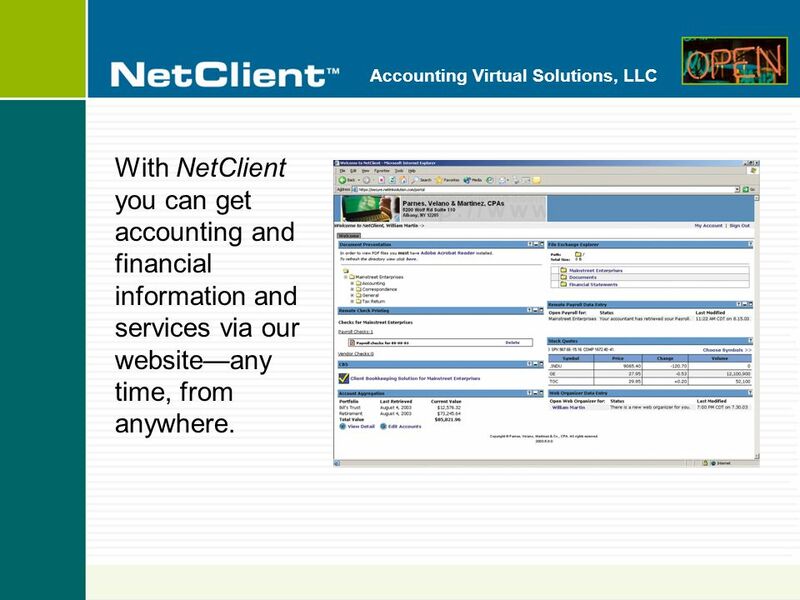 And its available from Accounting Virtual Solutions, LLC. Just give us a call at 787-771-7171. 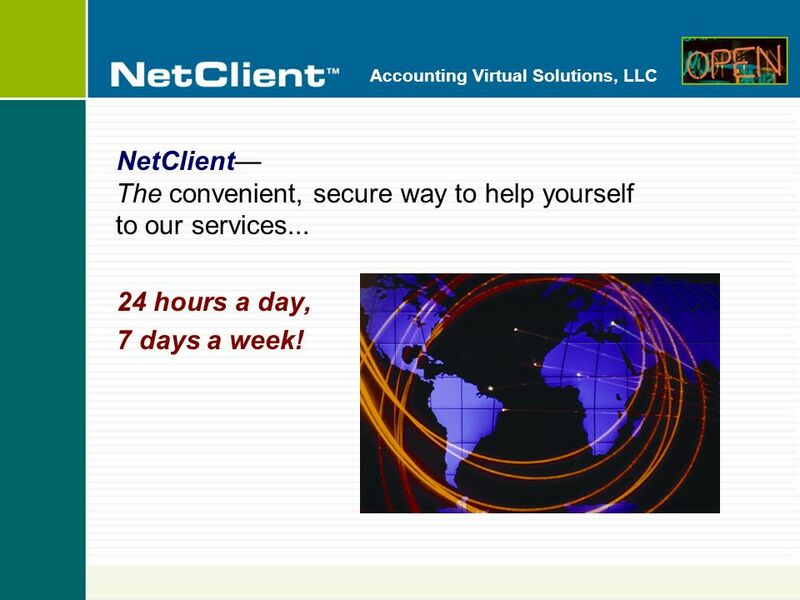 18 Accounting Virtual Solutions, LLC NetClient The convenient, secure way to help yourself to our services... 24 hours a day, 7 days a week! 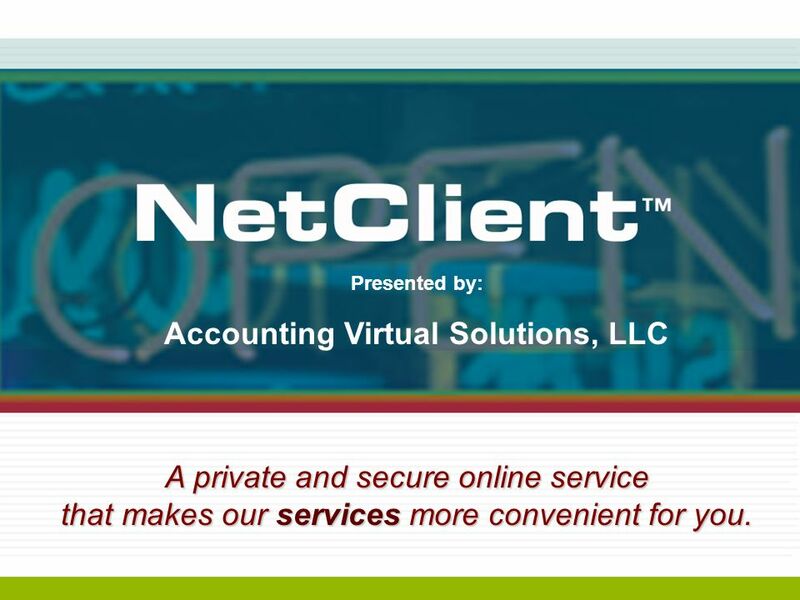 Download ppt "Presented by: Accounting Virtual Solutions, LLC A private and secure online service that makes our services more convenient for you." Presented by: Joseph W. Ebervein, CPA, CFP A private and secure online service that makes our services more convenient for you. Presented by: Your Firm Name. 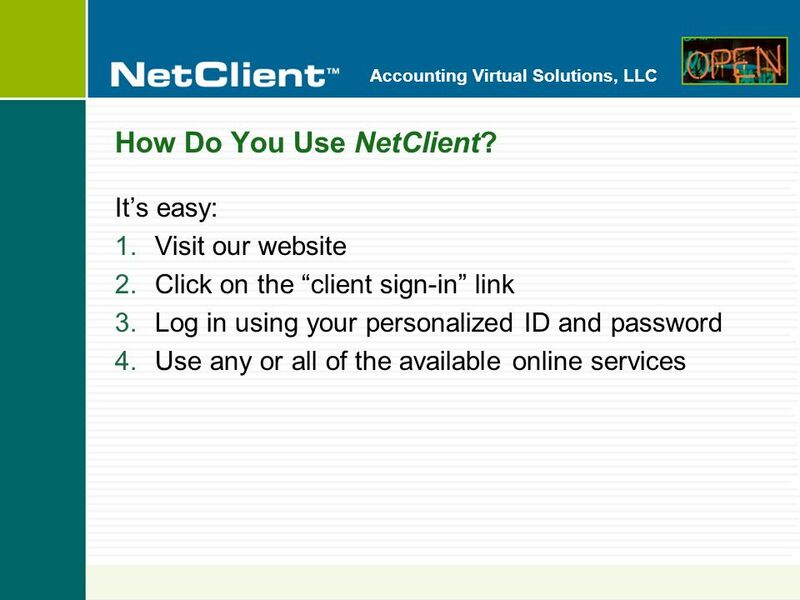 Your Firm Name Presented by: Secure Client Portals With NetClient CS secure portals, you can work with us any time, from. Presented by: Your Firm Name Jackson, Howard & Whatley, CPA's. About e-Services How to access? How to create user? How to file e-Returns? How to apply for e- Forms? Contact Details Commercial Taxes Department, Govt. Presented by: Allard, LTD CPA & Financial Services. BENUE STATE UNIVERSITY, MAKURDI The Directorate of Information and Communication Technology (ICT), BSU Makurdi. Presented by: Cassells & Associates, CPA, P.A.. Presented by: An always-on connection to your financials Accounting CS offers a completely new way to. Presented by: Miller and Smith A private and secure online service that makes our services more convenient for you. STREAMLINING DATA INPUT FOR HRMS USING ROBOT Session Number 1027 presented by Sandra Hurlburt and Alice Pelkman. Foundation Services SaaS/P4C/Bookkeeping Chad Ode.